Before using CiviPledge, you must enable it for your installation, if you have not done so already. Go to Administer > System Settings > Enable CiviCRM Components, and move CiviPledge into the box on the right to enable it. To create a new pledge on behalf of a constituent, navigate to Contributions > Pledges > New Pledge (note that an individual may do this themselves through an online contribution form; see the contributions section). One or more payment reminders can be emailed to the donor prior to the scheduled payment date. If a 'Self-service Payments Page' has been selected (see below), the reminder will include a link for the contributor to make their payment online. The Process Pledges (process_pledge) scheduled job must be enabled to updates pledge payment statuses and sends the payment reminders. Alternatively a cron job can be scheduled to run this specific task apart from other scheduled jobs. Refer to the Scheduled Jobs chapter for more information. The donor must have a valid email address (and must not have the "Do Not Email" flag checked). Send additional reminders: set the interval period between reminders, by the number of days, e.g. 5 days before the next reminder is sent. A donor can be given the option to make a scheduled payment online if a contribution page (with payment processor) has been created. 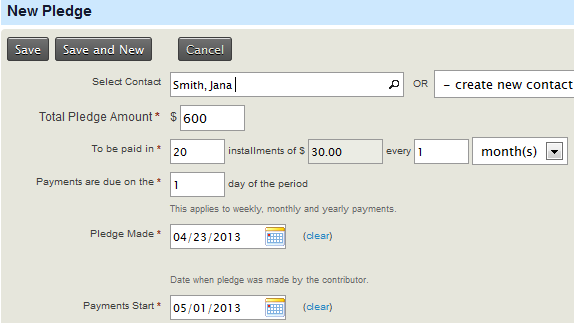 To do this, select a contribution page from the drop-down menu 'self-service payments page' when creating a new pledge. If reminders have been enabled for the pledge, a link to this page will be included in the body of the emails. To search for existing pledges, go to: Contributions > Pledges > Find Pledges. You may search by name, email address, or any discrete feature of the pledges themselves (e.g. payment start date, pledge status and honoree information). The search results page will display a summary of the pledges found, and view, edit and delete options are available for each record at the end of the rows. If the status of a pledge is 'in progress', there is also an option to cancel the pledge. You can view a list of recent pledges and a summary table of pledges recorded over the current month and past year on the pledges dashboard. 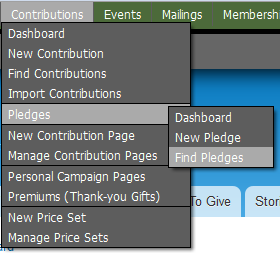 This can be reached through the Contributions menu: Contributions > Pledges > Dashboard.